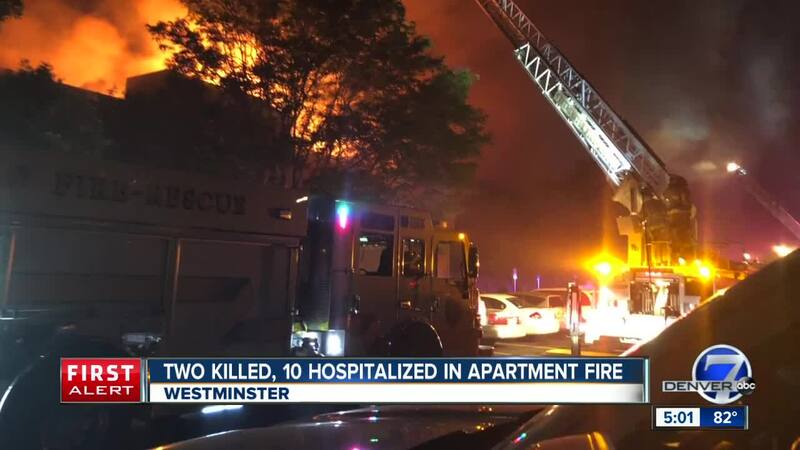 WESTMINSTER, Colo. — Two people are dead, one is unaccounted for and multiple others were injured following a massive blaze at an apartment complex in Westminster Sunday. 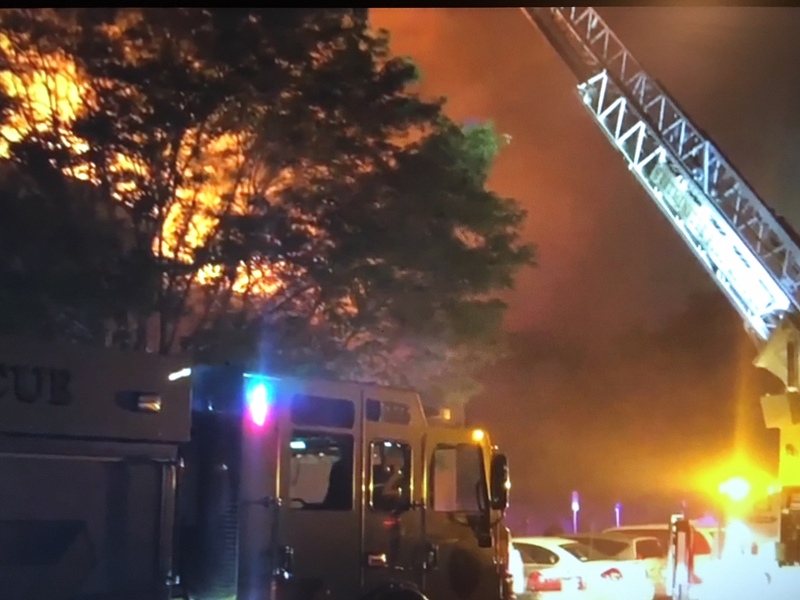 Witnesses told Denver7 that the blaze began before 2 a.m. Sunday, at the Westbury Apartments near West 115th Avenue and Pecos Street. Fire crews were dispatched at 2:16 a.m. and when they arrived, they found Building E, a 69-unit building, fully involved in flames. 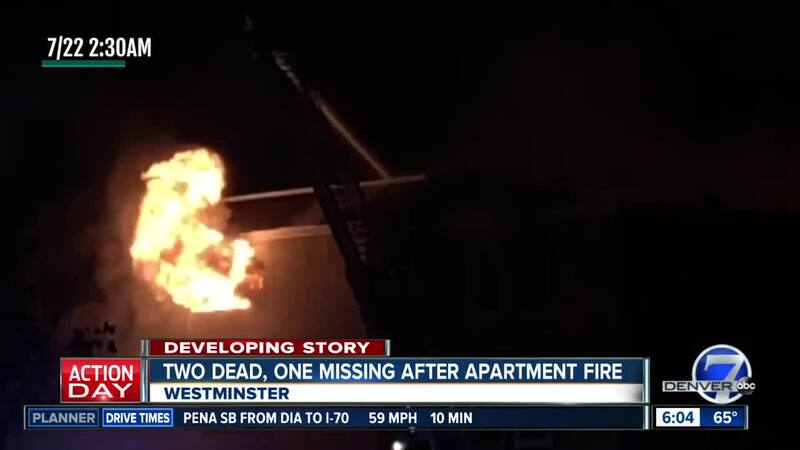 Many people escaped the flames by jumping out of their second and third story apartments, said Lt. Jeromy Hill with the Westminster Fire Department. Danielle Fasen's 7-year-old daughter, Abi, was among them. Fasen said they had just returned home from Cheyenne Frontier Days. "Abi and I were so tired, we fell asleep right away," she said. "Chloe started hearing people scream for help." Fasen checked the front door, then opened it and saw flames around the corner, and thick smoke in the hallway. She said they had no time to use the stairs, so she took her daughters out onto their third floor balcony. Neighbors outside below encouraged them to jump. "They said they'd catch us," she said. "I don't know what came over me. I had a sense of calm, and put (Abi) in literally a basket toss like this and threw her over the balcony." One of the Good Samaritans, Quincy Wise, caught the 7-year-old and yelled, "I've got her." Before Chloe could jump, Westminster Fire crews moved their ladder up to the balcony and rescued both Chloe and Danielle. The Fasens lost all their material possessions in the blaze, but Danielle said when she saw her daughters sleeping safely in a hotel room, she knew "there was nothing in the world better than making sure that they were alive." She knows that two fellow residents didn't survive. "I'm praying that it's not my next-door neighbors," she said, "because they're so sweet.... but they're the only two that I'm friends with that we haven't got an answer on what they're status is." Investigators said one of the victims was pronounced dead at the hospital, another was found inside the burned building. At least eight others were taken to a local hospital for treatment. Their injuries are unknown. By 6 pm, work crews, wearing filter masks, began placing a chain link fence around the property. Police remained on the scene overnight. As of 8:30 a.m. Monday, fire officials said there was still one resident who is unaccounted for. They are continuing their efforts to find this person. The cause of the fire has not yet been determined, but an investigation is underway. It took some time for investigators to start their process because the building was too dangerous to enter for some time. The roof has collapsed and tenants said there was a danger that the upper floors could collapse too. Approximately 30 residents were taken to Silver Hills Middle School while the American Red Cross responded to the scene of the blaze. A spokesperson for the Red Cross said late Sunday afternoon anyone still needing assistance will need to contact the Red Cross directly at 1-800-417-0495. If you saw the fire, please contact Westminster Fire Dispatch at (303) 658-4360.